Colombo, January 19 (The Citizen): Sri Lanka’s premier Tamil party, the Tamil National Alliance (TNA), is caught in a cleft stick. On the one hand, it has to cooperate with and need be prop up the United National Front (UNF) government led by Ranil Wickremesinghe. The Tamils see Wickremesinghe as being sympathetic to their interests and concerns in contrast to opposition leader Mahinda Rajapaksa, who is seen as being “anti-Tamil”. 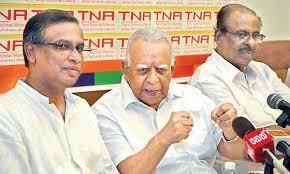 The TNA has to do the utmost to keep Rajapaksa away from power. But the TNA needs Rajapaksa’s Joint Opposition Group and President Sirisena’s Sri Lanka Freedom Party (SLFP) to get the two thirds majority necessary to get a new pro-Tamil constitution passed by parliament. The challenge is to oppose Rajapaksa and yet get his support for a new constitution. The TNA’s political future, indeed its very existence, depends on what it does at this juncture when the constitution-making process has reached a critical stage and political opinion is still very sharply divided on it. The opposition led by Rajapaksa has virtually declared war on the attempt to change the constitution. Sirisena’s SLFP is not enthusiastic about it. The silence of Wickremesinghe’s United National Party (SLFP) is ominous, though leader Wickremesinghe himself is in favor of a new constitution. In fact, the TNA had a hard time getting Wickremesinghe to table the draft constitution approved by the Steering Committee. It had to use the recent constitutional crisis to force him to agree. The bargain was struck during the October-November 2018 constitutional crisis which was triggered by the unconstitutional ouster of Wickremesinghe from the Lankan Premiership on October 26 by President Sirisena. In a swift and secret move, Sirisena had replaced Wickremesinghe by Rajapaksa, triggering an outrage throughout the democratic world. The 50-day crisis put Sri Lanka in sixes and sevens, but threw up a great political opportunity for the TNA, not just to get the constitution making process resumed, but to arrest its own declining electoral prospects in the Northern and Eastern provinces. The TNA, with its 16 MPs (later down to 14), played a critical role in ensuring the survival of the Wickremesinghe regime. But for its staunch support, and the critical role played by Jaffna district TNA MP, M.A.Sumanthiran, the newly appointed Prime Minister Mahinda Rajapaksa would have succeeded in engineering the defection of enough UNF MPs to consolidate his ill-gotten position. According to President Sirisena himself, MPs were offered up to Rs.500 million to defect. About 45 UNF MPs were seriously considering crossing over to Rajapaksa’s side. But when they learnt that the TNA and the Muslim parties had committed themselves to remaining with Wickremesinghe, they developed cold feet and banished all thought of defecting. They stayed put in the UNF, thus preventing Rajapaksa from getting the required majority support in parliament to remain in office. However, the TNA did not support Wickremesinghe blindly. It bargained hard to get a political deal which will help shore up its political fortunes in the Tamil speaking North and East. The TNA’s stock there had declined noticeably since the 2013 provincial and 2015 parliamentary elections. Its performance in the February 2018 local bodies’ elections was disappointing to say the least. The TNA could not deliver on its election promises to the Tamils about finding a political solution to the Tamil question and ensuring war-time accountability issues. The TNA-led Northern Provincial Council had failed to ensure any economic development despite the allocation of hundreds of millions of rupees by the government in Colombo. Large amounts of funds allocated by the Central government were returned unused. In its negotiations with Wickremesinghe and his lieutenants during the constitutional crisis, the TNA demanded that the draft constitution giving wide powers to the provinces which had been cleared by the Steering Committee, should be tabled in parliament as a priority, so that the constitution is passed before the next parliamentary elections in August 2020. The TNA also demanded that its MPs should be involved in the Central government’s economic development schemes in the Tamil areas in the North and East. This was considered to be of utmost importance because people had been complaining of the “top down” approach adopted by Colombo in designing and executing development projects in the North and East. The TNA wanted Wickremesinghe to give these assurances in writing in the form of an MoU. But Wickremesinghe sensed a political danger in doing that. However, he verbally assured that TNA MPs will be coopted in the developmental process and that he will table a draft constitution in parliament before Sri Lanka’s independence day on February 4, 2019. On becoming Prime Minister again, thanks to the Supreme Court, Wickremesinghe did place the Experts’ Committee’s report on the constitution. But he took the precaution of denying that it was a “draft constitution” in order not to give the document any finality. On its part, the TNA let it be known that the Wickremesinghe government will consult it on all matters relating to the North and East. But both the placing of the “draft” constitution on the table of the House and the understanding about consulting the TNA on North-East issues have run into a storm. The main opposition Sri Lanka Podujana Peramuna (SLPP), led by the Leader of the Opposition Mahinda Rajapaksa, opposed it both tooth and nail. Rajapaksa has dubbed the draft constitution as a scheme to divide Sri Lanka into “nine semi-independent provinces”. His party leaders have said that the main demand of the Tamils is not a new a constitution with greater devolution of power, but economic development and social welfare. The SLPP also believes that a new constitution is not needed and that amending the present one from time to time will suffice. And if a new constitution is indeed necessary, it should be made an issue in the coming parliamentary elections so that the people of Sri Lanka have a say. On the issue of involving the TNA in designing and executing development schemes in the Tamil areas, the SLPP’s view is that the main purpose of the scheme is not to help the people but to help the TNA refurbish its jaded image among the Tamils of the North and East and garner votes in the coming elections.